It is our understanding the Senate Majority Leader Mitch McConnell will have legislation submitted this Tuesday that mirrors Trump's promise to trade a form of a three-year Amnesty for DACA illegals for token border security funds. Trump also said that cutting this deal on DACA would build trust for broader immigration reform and all of us who have successfully fought to stop Amnesty legislation in DC for the last 15 years know this means AMNESTY FOR MILLIONS OF ILLEGAL ALIENS! We witnessed and documented Trump offering Amnesty for up to 4 million illegals in 2018 in an effort to pass similiar Amnesty for wall funds legislation in Congress. Now he says he wants Immigration Reform Amnesty and that means Amnesty for 20+ million! 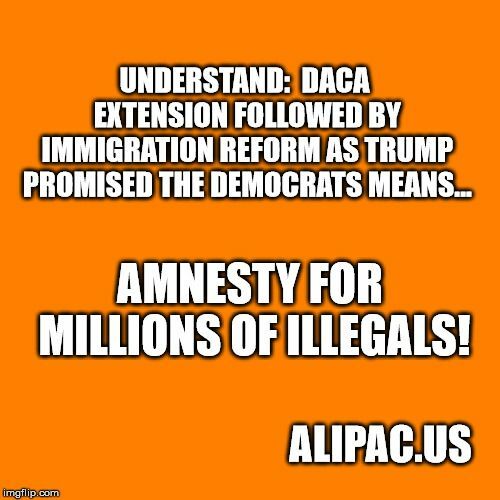 We fought hard and stopped Dream Act and Immigration Reform Amnesty under Bush and Obama since 2004, and now ALIPAC will fight Trump's Amnesty! Please share this meme above by email and on social media to help many confused Trump supporters understand what is really happening as we do. Then please support the funds drive to help us clear the $1,000 matching funds offer! Last edited by ALIPAC; 01-20-2019 at 05:26 PM. 5,000 Calls Needed To Stop Amnesty before Sat Morning! Are you ready to stop Amnesty and sweep Congress?